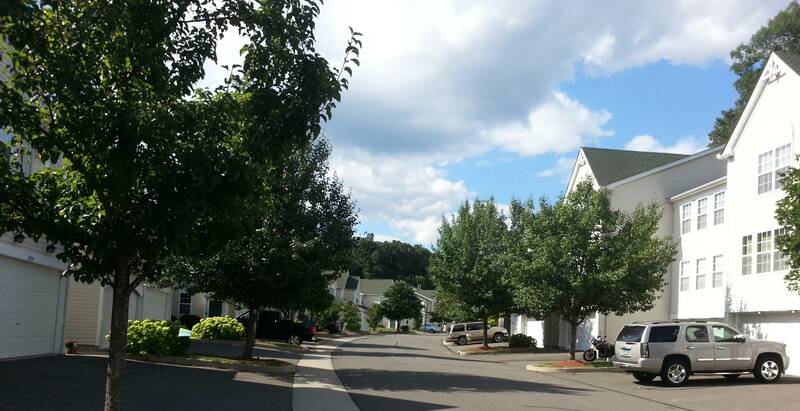 Located on Eaton Court in wooded Danbury, CT, is Lexington Mews, a large complex that was built in 2000. The 3 bedroom, 2.5 bathroom townhomes are around 2,304 square feet, guaranteeing plenty of space for families. These luxurious units at Lexington mews feature crown molding, soaring ceilings, and hardwood flooring throughout. Many of the gourmet eat-in kitchens have been renovated with cherry cabinets, granite countertops, and top of the line stainless steel appliances. With an open floor plan, there is easy access to the family room, which has a fireplace and sliders to the spacious deck. Bedrooms, located on the second floor, have vaulted ceilings and large windows to let light and air flow easily throughout the room. When natural air is not enough, however, central air will keep you cool in the summer and clean gas heat will make sure you stay warm in the winter months. The two car attached garage has access to full basement, which can be used for storage. There is also an attic, perfect for extra storage. On site is a pool, tennis courts, and playground, meaning fun for the whole family. Lexington Mews is located just minutes from the center of town, with many restaurants, a mall, and things to do. New York City is just an hour and a half away, perfect for commuters or those looking to get away for the afternoon or weekend.